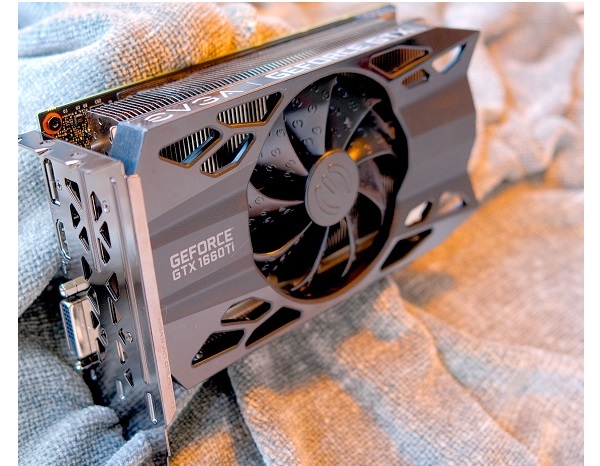 We tested the EVGA GTX 1660 Ti and were impressed. 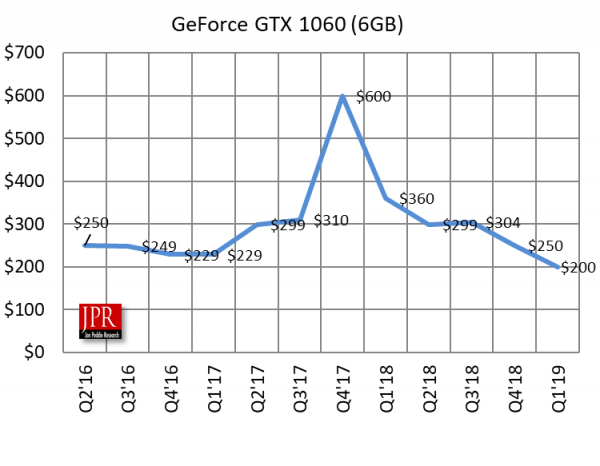 When Nvidia and its partners introduced the GTX 1060 in Q2’16, it had an introductory price of $250 (in today’s dollars it would be $262). This week they introduced the Turning based GTX 1660 Ti, the heir apparent to the GTX 1060 and there's not much significant change in the price tag. The MSRP for the new board is $300. The king is dead — long live the king. The 6 GB GTX 1060 was a formidable AIB and extremely well-positioned price-performance wise. When the crypto-mining craze hit, the GTX 1060 was one of the AIBs of choice, and its spot price more than doubled. The AIB, as good as it was/is, is two years old, and a lot has changed since then. Faster GDDR has been introduced, new APIs have been introduced, new CPU and DRAM have been introduced, and most important, amazing games have been introduced. Also, the price of monitors has dropped, and delightful new form-factors have been introduced like the curved 34-inch versions in 1440 and 1600-line varieties. A 27-in 4K HDR freesync monitor can be found today for under $300. Into that brave new world, Nvidia introduced the GTX 1660 Ti. Based on the Turing architecture. Not equipped with AI or ray tracing cores, and hence the GTX (and not RTX) prefix, the $300 MSRP AIB brings a lot of power and value to anyone looking to upgrade their AIB, and now that the mining craze has passed, the boards can be found for as low as $279. Several of the AIB partners have included a DVI connector so gamers with older monitors (why?) can use the new AIB. A couple of AIB partners even put two fans on the board. 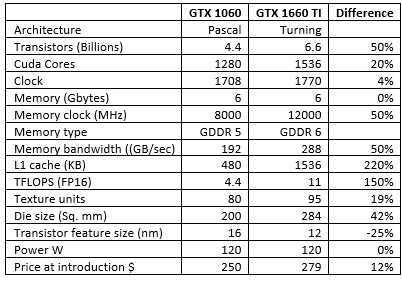 In addition to having more of everything, the GTX 1660 Ti also offers multiple methods of calculations (e.g., FP32, FP16, Int32), and can run those modalities simultaneously. Games such as SOTR (Shadow of the Tomb Raider) are mixing modality and using floating point and integer in the game at various places. The Turing architecture also introduced variable rate shading (VRS) which allow the GPU to adjust the shading rate for different parts of a scene or specific objects. That adjusts the workload to fit the image and can offer significant performance advantages, especially in a complex scene. The new GPU also offers adaptive shading which uses spatial and temporal color coherence across frames to average backgrounds and other areas that don’t frequently change, adding another performance boost. In addition to increasing the cache by 220% (partially due to going to a smaller feature size) the new GPU also has unified cache architecture for shared memory and L1. That allows the L1 to leverage resources that can increase its effective bandwidth up to four times. We ran four benchmarks and two games at three resolutions on the AIBs, and however, you want to measure it, the GTX 1660 Ti is the winner. 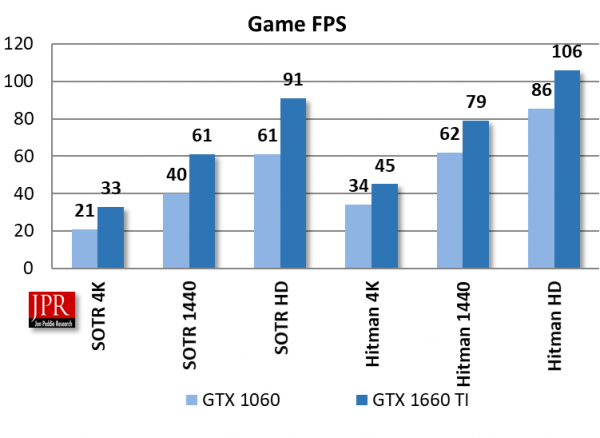 The frame rate has improved on average by 40% on the GTX 1660 Ti compared to the GTX 1060 across all resolutions and added an acceptable performance at 4K. Likewise, the benchmark fps scores average 42% higher with the GTX 1660 Ti compared to the GTX 1060. Moreover, as you might expect, we calculated the Pmark for the two AIBs, using the introductory price of the GTX 1060, and three different score parameters. 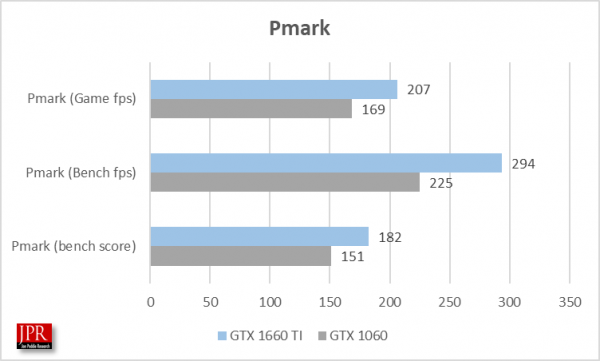 The Pmark showed an average improvement of 25% for the GTX 1660 Ti over the GTX 1060 if the GTX 1060 introductory price in 2019 dollars was used the scores would be even higher for the GTX 1660 Ti. The GTX 1660 Ti is probably going to be the biggest selling AIB for Nvidia’s partners in all of 2019 and the first half of 2020. There is a pent-up demand for a new AIB to run the new games. The RTX series, as novel and interesting as they are with their ray tracing and DLSS capabilities are simply too expensive for most people and the ray tracing capability, despite the enthusiasm game developers have for it just isn’t compelling enough to justify the price performance difference from a similar class GTX AIB. Therefore, the GTX 1660 Ti will satisfy all those gamers looking for the newest board. In addition to a faster overall AIB, the new GPU also has a built-in video encoder, which Nvidia is calling the NVENC. This will allow gamers who broadcast their gameplay to use one system to game and broadcast at the same time. There’s a lot to like in the GTX 1660 Ti, and it comes at a very affordable price.